Southern states undermined efforts at equality with laws designed to disfranchise blacks, despite of a series of federal equal-rights laws. African-American freed slaves in the South faced a number of struggles after the Civil War. General William Tecumseh Sherman passed an ordinance guaranteeing recently freed slaves land after his March to the Sea, but his orders had no force of law and were overturned. In the 1870s, Democrats gradually returned to power in the Southern states, sometimes as a result of elections in which paramilitary groups intimidated opponents, attacking blacks or preventing them from voting. Blacks were still elected to local offices in the 1880s, but the establishment Democrats were passing laws to make voter registration and electoral rules more restrictive. As a result, political participation by most blacks and many poor whites began to decrease. Those who could not vote were not eligible to serve on juries and could not run for local offices. They effectively disappeared from political life, as they could not influence the state legislatures, and their interests were overlooked. Ku Klux Klan: A racist vigilante group who violently suppressed black civil rights after the end of the Civil War. Jim Crow laws: State and local laws in the United States enacted between 1876 and 1965 that mandated de jure racial segregation in all public facilities in Southern states of the former Confederacy. forty acres and a mule: A short-lived policy of providing arable land and an army mule to black former slaves, enacted by Major General William Tecumseh Sherman. During the Reconstruction period of 1865–1877, federal law provided civil rights protection in the U.S. South for freedmen, the African Americans who had formerly been slaves. In the 1870s, Democrats gradually returned to power in the Southern states, sometimes as a result of elections in which paramilitary groups intimidated opponents, attacking blacks or preventing them from voting. Gubernatorial elections were close and disputed in Louisiana for years, with extreme violence being unleashed during the campaigns. In 1877, a national compromise to gain Southern support in the presidential election resulted in the last of the federal troops being withdrawn from the South. White Democrats had regained political power in every Southern state. These conservative, white, Democratic Redeemer governments legislated Jim Crow laws, which segregated black people from the white population, and upheld them constitutionally as “separate but equal” rights. The Special Field Orders issued by Sherman were never intended to represent an official policy of the U.S. government with regard to all former slaves. Andrew Johnson, who succeeded President Lincoln after the assassination, revoked Sherman’s orders and returned the land to its previous white owners. Because of this, the phrase “forty acres and a mule” has come to represent the failure of Reconstruction policies in restoring to African Americans the fruits of their labor. During this time, the federal government also attempted to provide aid to black Southerners through the Freedmen’s Bureau. The bureau was created through the Freedmen’s Bureau Bill, which was initiated by President Abraham Lincoln, and was intended to last for one year after the end of the Civil War. On March 3, 1865, Congress passed the bill to aid former slaves through legal food and housing, oversight, education, health care, and employment contracts with private landowners. At the end of the war, the Freemen’s Bureau’s main role was providing emergency food, housing, and medical aid to refugees; it also helped reunite families. Later, it focused its work on helping the freedmen adjust to their condition of freedom by setting up work opportunities and supervising labor contracts. It soon became, in effect, a military court that handled legal issues. The bureau distributed 15 million rations of food to African Americans, and set up a system in which planters could borrow rations in order to feed freedmen they employed. The most widely recognized of the Freedmen’s Bureau’s achievements is its accomplishments in the field of education. Prior to the Civil War, no Southern state had a system of universal state-supported public education. Freedmen had a strong desire to learn to read and write. They had worked hard to establish schools in their communities prior to the advent of the Freedmen’s Bureau. By 1866, missionary and aid societies worked in conjunction with the Freedmen’s Bureau to provide education for former slaves. The bureau faced many challenges despite its good intentions, efforts, and limited successes. By 1866, it was attacked by Southern whites for organizing blacks against their former masters. That same year President Andrew Johnson, supported by Radical Republicans, vetoed a bill for an increase of power for the bureau. Many local bureau agents were hindered in carrying out their duties by the opposition of former Confederates, and lacked a military presence to enforce their authority. 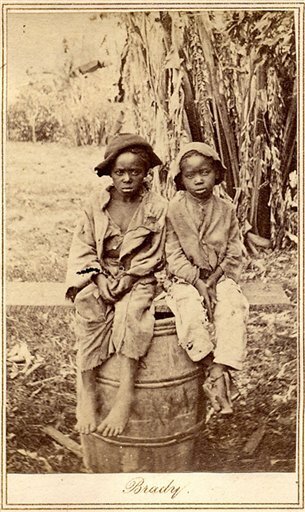 Slave children: Two children who were likely emancipated during the Civil War, circa 1870. Jim Crow laws were state and local laws enforcing racial segregation in the Southern United States. Many of these laws were focused on legally disfranchising the freedmen, especially with regard to voting, thereby blocking their participation in political life. Blacks were still elected to local offices in the 1880s, but the establishment Democrats were passing laws to make voter registration and electoral rules more restrictive. As a result, political participation by most blacks and many poor whites began to decrease. Between 1890 and 1910, 10 of the 11 former Confederate states, starting with Mississippi, passed new constitutions or amendments that effectively disfranchised most blacks and tens of thousands of poor whites through a combination of poll taxes, literacy and comprehension tests, and residency and record-keeping requirements. Grandfather clauses temporarily permitted some illiterate whites to vote. Those who could not vote were not eligible to serve on juries and could not run for local offices. They effectively disappeared from political life, as they could not influence the state legislatures, and their interests were overlooked. Public schools had been established by Reconstruction legislatures for the first time in most Southern states. The schools for black children were consistently underfunded compared to schools for white children, even when considered within the strained finances of the postwar South. The decreasing price of cotton kept the agricultural economy at a low. White supremacist paramilitary organizations, allied with Southern Democrats, used intimidation, violence, and assassinations to repress blacks and prevent them from exercising their civil rights in elections from 1868 until the mid-1870s. The insurgent Ku Klux Klan (KKK) was formed in 1865 in Tennessee (as a backlash to defeat in the war) and quickly became a powerful secret vigilante group, with chapters across the South. The Klan initiated a campaign of intimidation directed against blacks and sympathetic whites. Their violence included vandalism and destruction of property, physical attacks and assassinations, and lynchings. Teachers who came from the North to teach freedmen were sometimes attacked or intimidated as well. After the Civil War, many African Americans and former slaves became Republicans and officeholders. Most African Americans served in local offices, with very few serving in national offices. 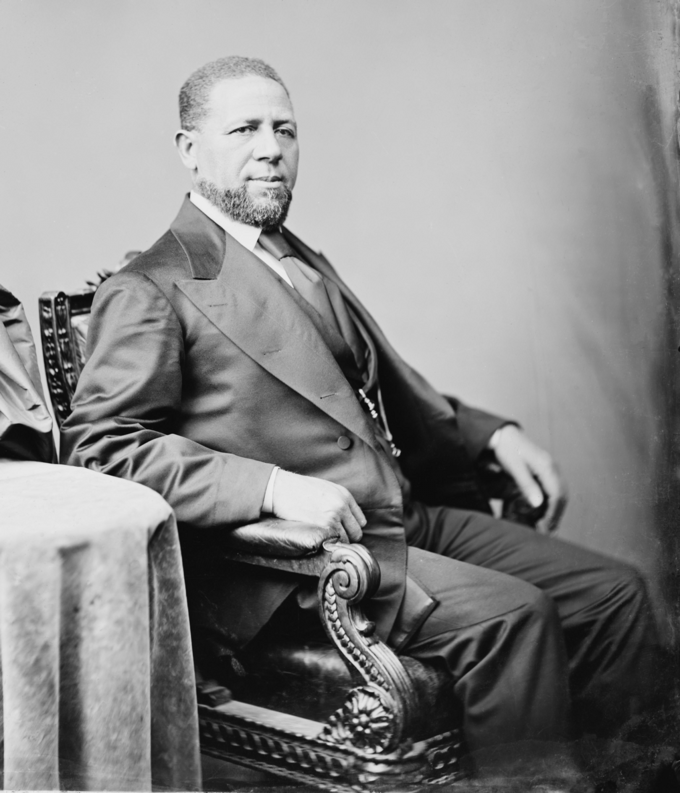 Hiram Rhodes Revels was the first African American to serve in Congress as a senator. Joseph Hayne Rainey was the first African American to serve as a congressman. At the beginning of 1867, no African American in the South held political office, but within three or four years, a significant minority of officeholders in the South were black. The Fifteenth Amendment guaranteed African-American men the right to vote, but it did not guarantee that the vote would be counted or that the districts would be apportioned equally. Reconstruction: A period of U.S. history, from 1865 to 1877, during which the nation tried to resolve the status of the ex-Confederate states, the ex-Confederate leaders, and freedmen (ex-slaves) after the American Civil War. Fifteenth Amendment: Prohibits each government in the United States from denying a citizen the right to vote based on that citizen’s, “race, color, or previous condition of servitude” (for example, slavery). It was ratified on February 3, 1870. After the Civil War, Republicans took control of all Southern state governorships and state legislatures except Virginia’s. The Republican coalition elected numerous African Americans to local, state, and national offices. Although they did not dominate any electoral offices, black representatives voting in state and federal legislatures marked a drastic social shift. At the beginning of 1867, no African American in the South held political office, but within three or four years, a significant minority of officeholders in the South were black. About 137 black officeholders had lived outside of the South before the Civil War. Some had escaped from slavery to the North, become educated, and returned to help the South advance in the postwar era. Others were free blacks before the war, who had achieved education and positions of leadership elsewhere. Other African-American men who served were already leaders in their communities, including a number of preachers. As happened in white communities, not all leadership depended upon wealth and literacy. Hiram Rhodes Revels: U.S. Senator Hiram Rhodes Revels, the first African American in Congress. A few African Americans were elected or appointed to national office. African Americans voted for white candidates and for blacks. The Fifteenth Amendment guaranteed the right to vote, but did not guarantee that the vote would be counted or the districts would be apportioned equally. In addition, establishment Democrats passed laws to make voter registration and electoral rules more restrictive, with the result that political participation by most blacks was stifled. As a result, states with a majority African-American population often elected only one or two African-American representatives in Congress. Exceptions included South Carolina; at the end of Reconstruction, four of its five congressmen were African American. Hiram Rhodes Revels (September 27, 1827–January 16, 1901) was the first African American to serve in the U.S. Senate. Because he preceded any African American in the House, he was the first African American in the U.S. Congress as well. He represented Mississippi in 1870 and 1871. As a senator, Revels advocated compromise and moderation. He vigorously supported racial equality and worked to reassure his fellow senators about the capability of African Americans. In his maiden speech to the Senate on March 16, 1870, he argued for the reinstatement of the black legislators of the Georgia General Assembly, who had been illegally ousted by white Democratic Party representatives. Joseph Rainey: U.S. Representative Joseph Rainey, the first African American to be directly elected to Congress. Joseph Hayne Rainey (June 21, 1832–August 1, 1887) was the first African American to serve in the U.S. House of Representatives, the second black person to serve in the U.S. Congress, the first African American to be directly elected to Congress (Revels had been appointed), and the first black presiding officer of the U.S. House of Representatives. During his term in Congress, Rainey supported legislation to protect the civil rights of Southern blacks, working for two years to gain passage of the Civil Rights Act of 1875. He also worked to promote the Southern economy. In May 1874, Rainey became the first African American to preside over the House of Representatives as Speaker pro tempore. Rainey was born into slavery, and was freed in the 1840s when his father purchased his and his family’s freedom. “Carpetbaggers” and “scalawags” are pejorative terms that were used by Southerners during the Reconstruction period. The term “carpetbaggers” refers to Northerners who moved to the South after the Civil War, during Reconstruction. Many carpetbaggers were said to have moved South for their own financial and political gains. Scalawags were white Southerners who cooperated politically with black freedmen and Northern newcomers. Scalawags typically supported the Republican Party. scalawag: Any white Southerner who supported the federal plan of Reconstruction after the Civil War, or who joined with the black freedmen and the carpetbaggers in support of Republican Party policies. carpetbagger: A pejorative term for a Northerner who moved to the South after the American Civil War, especially one who went South to gain political influence or personal wealth. This term also can refer to someone perceived as intervening in the politics of an area without actually having a connection to that area. Three groups comprised the Republican Party in the South after the Civil War. “Scalawags” were white Southerners who supported the party, “carpetbaggers” were recent arrivals from the North, and freedmen were freed slaves. Although “carpetbagger” and “scalawag” were originally terms of opprobrium, they are now commonly used in scholarly literature. Politically, the carpetbaggers were usually dominant; they comprised the majority of Republican governors and congressmen. However, the Republican Party inside each state was increasingly torn between the more conservative scalawags on one side and the more Radical carpetbaggers with their black allies on the other. In most cases, the carpetbaggers won out, and many scalawags moved into the conservative or Democratic opposition. 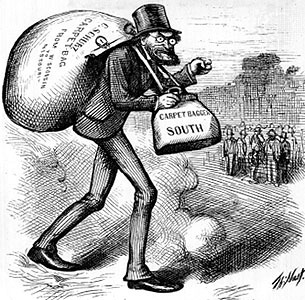 In the context of U.S. history, the term “carpetbagger” is used to describe Northerners who moved to the South after the Civil War, during Reconstruction (1865 to 1877). The term referred to the observation that many of these newcomers carried their belongings in “carpet bags.” This was a sturdy, common form of luggage at the time, and was made from pieces of used carpet. The term “carpetbagger” was used in a derogatory fashion, and communicated the fear, among Southerners, that opportunistic outsiders were conspiring to exploit Southern resources. Carpetbagger: This political cartoon from 1872 depicts carpetbaggers in a negative light. Together with Republicans, carpetbaggers were viewed as politically manipulating formerly Confederate states for their own financial and political gains. Carpetbaggers were seen as insidious Northern outsiders with questionable objectives, who attempted to meddle with, and control, Southern politics. In fact, carpetbaggers became a powerful political force during Reconstruction. Sixty carpetbaggers were elected to Congress, and they included a majority of Republican governors in the South during Reconstruction. Many carpetbaggers moved to the South as social reformers. Beginning in 1862, Northern abolitionists moved to areas in the South that had fallen under Union control. Schoolteachers and religious missionaries arrived in the South, some sponsored by Northern churches. Some were abolitionists who sought to continue the struggle for racial equality; they often became agents of the federal Freedmen’s Bureau, which started operations in 1865 to assist the vast numbers of recently emancipated slaves. The bureau established schools in rural areas of the South for the purpose of educating the mostly illiterate black population. Other Northerners who moved to the South participated in rebuilding railroads that had been previously destroyed during the war. During the time blacks were enslaved, they were prohibited from being educated and attaining literacy. Southern states had no public school systems, and white Southerners either sent their children to private schools or employed private tutors. After the war, hundreds of Northern white women moved South, many to teach newly freed African-American children. While some Northerners went South with reformist impulses, many others went South merely to exploit the chaotic environment for personal gain. Many carpetbaggers were businessmen who purchased or leased plantations and became wealthy landowners, hiring freedmen to do the labor. Most were former Union soldiers eager to invest their savings in this promising new frontier, and civilians lured South by press reports of easy money on cotton plantations. Following the Civil War, carpetbaggers often bought plantations at fire-sale prices. Because of this and other behavior, they were generally considered to be taking advantage of those living in the South. A carpetbagger should not be confused with a “copperhead,” a term given to Northerners who sympathized with the cause of Southern secession. In U.S. history, “scalawag” was a term used for white Southerners who supported Reconstruction and the Republican Party after the Civil War. Like “carpetbagger,” the term “scalawag” has a long history of use as a slur. Typically, it was used by conservative, pro-federation Southerners to derogate individuals whom they viewed as betraying Southern values by supporting Northern policies such as desegregation. In historical studies, the term is commonly used as a neutral descriptor for Southern white Republicans, but some historians have discontinued this habit because of the term’s pejorative origin. During Reconstruction, scalawags formed coalitions with black freedmen and Northern newcomers to take control of state and local governments. Despite being a minority, these groups gained power by taking advantage of the Reconstruction laws of 1867. These laws disenfranchised individuals who could not take the Ironclad Oath. Any individual who had served in the Confederate Army, or who had held office in a state or Confederate government, was not allowed to take this oath. Because they were unable to take this oath, these individuals were disenfranchised. The coalition controlled every former Confederate state except Virginia, as well as Kentucky and Missouri (which were claimed by the North and the South) for varying lengths of time between 1866 and 1877. Two of the most prominent scalawags were General James Longstreet, one of Robert E. Lee’s top generals, and Joseph E. Brown, who had been the wartime governor of Georgia. Scalawags were denounced as corrupt by Democrats. The Democrats alleged that the scalawags were financially and politically corrupt, and willing to support bad government because they profited personally. Scalawags, along with carpetbaggers, were also targets of violence, mainly by the Ku Klux Klan. In an 1868 newspaper interview, Nathan Forrest, the Grand Wizard of the KKK, stated that the Klan’s primary opposition was to the Loyal Leagues, Republican state governments, people such as Tennessee governor William Gannaway Brownlow, and other “carpetbaggers” and “scalawags.” During the 1870s, many scalawags left the Republican Party and joined the conservative-Democrat coalition. The American South remained heavily rural for decades after the Civil War; sharecropping was widespread as a response to economic upheaval. Many former slaves became sharecroppers, working under a system in which they farmed an owner’s land in exchange for sharing the yield of the crop. Farmers who owned their own equipment were tenant farmers and paid a smaller fee for use of the owner’s land. They enjoyed more freedom than the sharecroppers. Sharecroppers included both black and poor white farmers and had little, if any, chance for advancement or profit. Racial segregation and outward signs of inequality were everywhere and rarely were challenged. Blacks who violated the color line were susceptible to expulsion or lynching. tenant farmer: A person who farms land rented from a landlord. The renter provides his or her own farming tools and resources. sharecropper: A person who enters an agreement with a landowner to farm the land and then pays a portion (share) of the produce as rent. Landowners provide most or all of the resources needed to farm. The South remained heavily rural after the Civil War, up until World War II. There were only a few scattered cities; small courthouse towns serviced the farm populations. Local politics revolved around the politicians and lawyers based at the courthouse. Mill towns, narrowly focused on textile production or cigarette manufacturing, began opening in the Piedmont region, especially in the Carolinas. Racial segregation and outward signs of inequality were everywhere and rarely were challenged. Blacks who violated the color line were susceptible to expulsion or lynching. Cotton became even more important than before, even though prices were much lower. White Southerners showed a reluctance to move North, or to move to cities, so the number of small farms proliferated, and they became smaller and smaller as the population grew. Sharecropping became widespread as a response to economic upheaval caused by the emancipation of slaves and disenfranchisement of poor whites in the agricultural South during Reconstruction. When slavery ended, the large slave-based plantations were mostly subdivided into tenant or sharecropper farms of 20 to 40 acres. Many white farmers (and some blacks) owned their land. However, sharecropping, along with tenant farming, became a dominant form in the cotton South from the 1870s to the 1950s, among both blacks and whites. By the 1960s both had largely disappeared. Sharecropping was a way for very poor farmers, both white and black, to earn a living from land owned by someone else. The landowner provided land, housing, tools, and seed (and perhaps a mule), and a local merchant provided food and supplies on credit. At harvest time, the sharecropper received a share of the crop (from one-third to one-half, with the landowner taking the rest). The sharecropper used his share to pay off his debt to the merchant. The system started with blacks when large plantations were subdivided. By the 1880s, white farmers also became sharecroppers. Plantations had first relied on slaves for cheap labor. Prior to emancipation, sharecropping was limited to poor landless whites, usually working marginal lands for absentee landlords. Following emancipation, sharecropping came to be an economic arrangement that largely maintained the status quo between blacks and whites through legal means. In the Reconstruction-era United States, sharecropping was one of few options for penniless freedmen to conduct subsistence farming and support themselves and their families. Other solutions included the crop-lien system (in which the farmer was extended credit for seed and other supplies by the merchant), the rent-labor system (in which former slaves rented land but kept the entire crop), and the wage system (in which the worker earned a fixed wage, but kept none of his crop). Sharecropping was by far the most economically efficient, as it provided incentives for workers to produce a bigger harvest. It was a stage beyond simple hired labor, because the sharecropper had an annual contract. During Reconstruction, the Freedmen’s Bureau wrote and enforced the contracts. Though the arrangement protected sharecroppers from the negative effects of a bad crop, many sharecroppers (both black and white) were economically confined to serf-like conditions of poverty. To work the land, sharecroppers had to buy seed and implements, sometimes from the plantation owner who often charged exorbitant prices against the sharecropper’s next season. Sharecroppers: Sharecroppers on the roadside after eviction (1936). “Rural tenancy” refers to a type of tenant-farming arrangement that a landowner can use to make full use of property he may not otherwise be able to develop properly. A “tenant” or non-landowner will take residency on the property of the landowner and work the land in exchange for giving the landowner a percentage of the profits from the eventual crop. 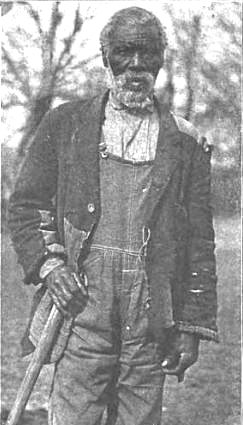 Former slave, 1915: A former slave, from an Alabama cotton plantation. This system was distinct from the sharecropper. Unlike sharecroppers, who were given all resources by the landowner, tenant farmers rented the land, provided their own tools and mule, and received half the crop. Landowners provided more supervision to sharecroppers, and less or none to tenant farmers. Tenant farming was historically a step up on the “agricultural ladder” from hired hand or sharecropper taken by young farmers as they accumulated enough experience and capital to buy land. The term “rural tenancy” usually describes the situation of previously enslaved people who were then tenants on the landowner’s property. The landowner would extend to the farmer shelter, food, and necessary items on credit to be repaid out of the tenant’s share of the crop. The farmer could, if he desired, charge the tenant extremely high interest on the advanced pay because there were no lending laws applicable to migrant or tenant workers at the time. This could ultimately result in the tenant owing the landlord more money than his share of the crop at harvest, forcing the farmer to be further indentured to the landowner. Landowners in the South frequently used this practice after slavery was abolished. Modern day tenancy is much more highly regulated, and these practices are more rare. Radical Republicans in Congress, led by Stevens and Sumner, opened the way to suffrage and legal equality for freedmen. The Radical Republicans aimed to undermine the power of ex-Confederates and provide civil rights, such as suffrage, for the recently freed slaves. Senator Lyman Trumbull proposed the first Civil Rights Law, which stated that African Americans were to be granted equal rights as citizens in all aspects. The Radical Republicans also passed the Reconstruction Amendments, which were directed at ending slavery and providing full citizenship to freedmen. Northern Congressmen believed that providing black men with suffrage would be the most rapid means of political education and training. Many of the political and legal advances made by African Americans during the Reconstruction period were undermined by laws passed by individual states and the Supreme Court. Reconstruction Amendments: The Thirteenth, Fourteenth, and Fifteenth Amendments to the U.S. Constitution, adopted between 1865 and 1870, the five years immediately following the Civil War. Charles Sumner: A Radical Republican senator from Massachusetts who led efforts in Congress to provide civil rights to freedmen. Radical Republicans: A loose faction of American politicians within the Republican Party from about 1854 (before the American Civil War) until the end of Reconstruction in 1877. Radicals strongly opposed slavery during the war and after the war distrusted ex-Confederates, demanding harsh policies for the former rebels, and emphasizing civil rights and voting rights for freedmen (recently freed slaves). The Radical Republicans were a faction of American politicians within the Republican Party of the United States from about 1854 until the end of Reconstruction in 1877. They called themselves “Radicals” and were opposed during the Civil War by moderate Republicans (led by Abraham Lincoln), conservative Republicans, and the largely proslavery (and later anti-Reconstruction) Democratic Party. Radical Republicans strongly opposed slavery during the war and after the war distrusted ex-Confederates, demanding harsh policies for punishing the former rebels, and emphasizing equality, civil rights, and voting rights for the freedmen. By 1866, the Radical Republicans supported federal civil rights for freedmen, which President Johnson opposed. By 1867, they defined terms for suffrage for freed slaves and limited early suffrage for many ex-Confederates. While Johnson opposed the Radical Republicans on some issues, the decisive congressional elections of 1866 gave the Radicals enough votes to enact their legislation over Johnson’s vetoes. Through elections in the South, ex-Confederate officeholders were gradually replaced with a coalition of freedmen, Southern whites (scalawags), and Northerners who had resettled in the South (carpetbaggers). Charles Sumner: Charles Sumner (January 6, 1811–March 11, 1874) was an American politician and senator from Massachusetts. During Reconstruction, he fought to minimize the power of the ex-Confederates and to guarantee equal rights to the freedmen. Concerned that President Johnson was attempting to subvert congressional authority, Republicans in Congress took control of Reconstruction policies after the election of 1866. Radical Republicans, led by Charles Sumner and Thaddeus Stevens, opened the way to suffrage for male freedmen. As the chief Radical leader in the Senate during Reconstruction, Sumner fought hard to provide equal civil and voting rights for the freedmen on the grounds that “consent of the governed” was a basic principle of American republicanism, and to block ex-Confederates from power so they would not reverse the gains made from the Union’s victory in the Civil War. During fall 1865, as a response to the Black Codes and worrisome signs of Southern recalcitrance, the Radical Republicans blocked the readmission of the former rebellious states to the Congress. Johnson, however, was content with allowing former Confederate states into the Union as long as their state governments adopted the Thirteenth Amendment abolishing slavery. By December 6, 1865, the amendment was ratified, and Johnson considered Reconstruction over. Radical Republicans in Congress disagreed. They rejected Johnson’s moderate Reconstruction efforts, and organized the Joint Committee on Reconstruction, a 15-member panel to devise more stringent Reconstruction requirements for the Southern states to be restored to the Union. In January 1866, Congress renewed the Freedmen’s Bureau, which Johnson vetoed in February. Although Johnson sympathized with the plights of the freedmen, he was against federal assistance. An attempt to override the veto failed on February 20, 1866. This veto shocked the congressional Radicals. In response, both the Senate and House passed a joint resolution not to allow any senator or representative seat admittance until Congress decided when Reconstruction was finished. Senator Lyman Trumbull of Illinois, leader of the moderate Republicans, took the Black Codes as an affront. He proposed the first Civil Rights Law, because the abolition of slavery was empty if laws were to be enacted and enforced depriving persons of African descent of privileges which were essential to free citizens. The law stated that African Americans were to be granted equal rights as citizens. Congress later passed the Civil Rights Bill. Although strongly urged by moderates in Congress to sign the Civil Rights Bill, Johnson broke decisively with them by vetoing it on March 27, 1866. His veto message objected to the measure because it conferred citizenship on the freedmen at a time when 11 out of 36 states were unrepresented and attempted to fix by Federal law, “a perfect equality of the white and black races in every State of the Union.” Johnson said it was an invasion by federal authority of the rights of the United States. It had no warrant in the Constitution and was contrary to all precedents. The Democratic Party, proclaiming itself the party of white men, North and South, supported Johnson. However, the Republicans in Congress overrode his veto. The Senate overrode the veto by the close vote of 33:15, the House by 122:41. Then, the Civil Rights Bill became law. Congress also passed another version of the Freedmen’s Bureau Bill, which Johnson again vetoed. This time, however, Radical Republicans mustered enough congressional support to override Johnson’s veto. The Radical Republicans also passed the Reconstruction Amendments, which were directed at ending slavery and providing full citizenship to freedmen. Northern Congressmen believed that providing black men with suffrage would be the most rapid means of political education and training. For instance, the Fourteenth Amendment, whose principal drafter was John Bingham, was designed to put the key provisions of the Civil Rights Act into the Constitution. It extended citizenship to everyone born in the United States (except visitors and Indians on reservations), penalized states that did not give the vote to freedmen, and most importantly, created new federal civil rights that could be protected by federal courts. Johnson used his influence to block the amendment in the states. While many blacks took an active part in voting and political life, and rapidly continued to build churches and community organizations, white Democrats and insurgent groups used force to regain power in the state legislatures, passing laws that effectively disfranchised most blacks and many poor whites in the South. Many of the ambitions of the Radical Republicans were, in the end, undermined and unfulfilled. Early Supreme Court rulings around the turn of the century upheld many of these new Southern constitutions and laws, and most blacks were prevented from voting in the South until the 1960s. Full federal enforcement of the Fourteenth and Fifteenth Amendments did not occur until passage of legislation in the mid-1960s as a result of the African-American Civil Rights Movement (1955–1968).